With the recent birth of a baby Panda cub to Lin Hui and Xuang Xuang at Chiang Mai zoo in Bangkok everyone in Thailand has had Pandas on their mind. This has upset local Elephant keepers at the Ayutthaya-Elephant Kraal. With announcements of a 20 million baht snow house being built for the Panda family the keepers are wondering just why Thailand has forgotten that the Elephant is their national symbol. 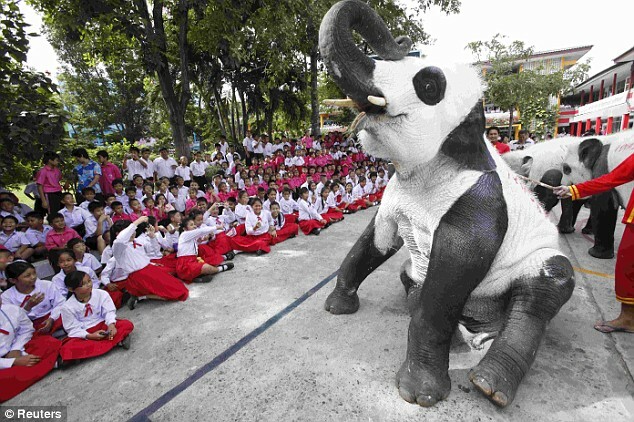 Aside from speaking up about the problem the Elephant keepers at the Ayutthaya-Elephant Kraal have taken it one step further by painting five of their elephants to look like Pandas. This attention grabbing effort seems to be doing the job as Thai people are not only noticing but applauding their efforts. Although rumor has it some Panda lovers are slightly irked. The keepers were quick to let everyone know that the paint was only water colors but I for one hope that these images make a lasting impression long after the paint has been washed off. Much still needs to be done to protect Thailand’s national treasure and make sure they will always be safe and well treated in the kingdom. It may be a publicity stunt but I have to say that the Elephant Pandas are much cuter than their Chinese friends currently in the spotlight. Oh my goodness… This is my first real panda news. From what I’m hearing on twitter and blogs, everyone has been hearing about the furry little creatures for weeks. 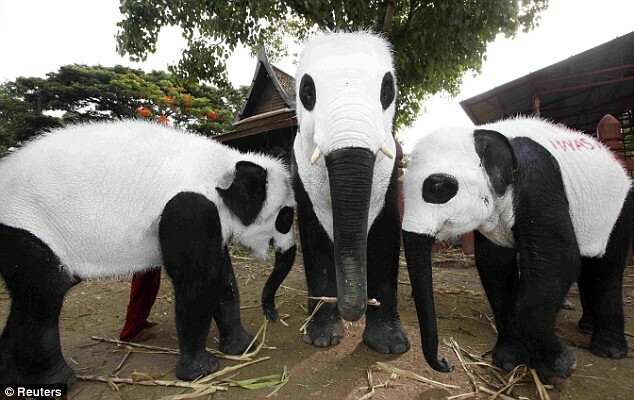 And I do have to say that the panda elephants are quite… striking… but odd. Very odd! You really got me with that one. I was staring at that first photo then realised that there was something odd about the three Pandas. I failed to notice the Elephant’s trunk until I scrolled down the page. Talen it certainly beats the elephants being covered in adverts for Chang beer and Everton FC! Not sure what their wild cousins would make of them! Mike´s last blog ..Free Thai Tourist Visa -Not Free in UK! This is the first I’ve seen of this and it’s given me a broad smile to take to work tonight. I think their new colours make them look kind of cool. Perhaps something like that would be a good idea for the Elephant football matches that I believe they have in Chiang Mai or wherever. Cheers for that. On the train into London this morning I held up a similar picture featured in the Saturday edition of the ‘Daily Mail’ newspaper to my wife. For about 10 seconds she looked and then burst out laughing, after reading the article she soundly agreed that the current fuss being made over a panda cub, an animal not even native to Thailand, is wrong. Those Panda Elephants are just wonderful.